This is a blend of different strong seasoning that can be used year round which is include thyme, celery salt and sage. Dried thyme and dried sage create the base of poultry seasoning. Added flavorings include oregano, marjoram, rosemary, pepper or nutmeg. 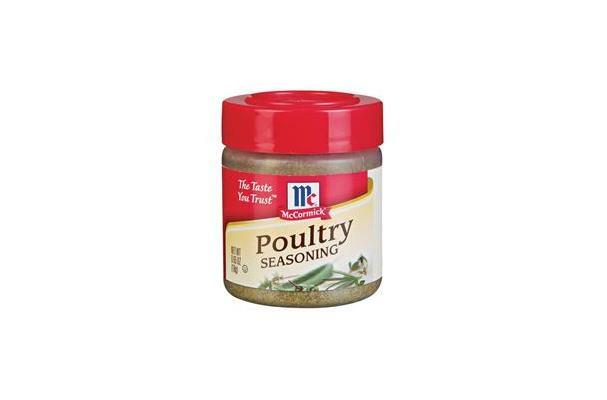 Poultry seasoning is a powdery mixture of ground spices and herbs. Choosing: For commercially packed poultry seasoning, check the container for the production or expiration date. Make sure there are no holes, signs of damage on the packaging or container. Buying: Poultry seasoning is commercially available in most supermarkets. History: It is believed that William G Bell of the Bell's seasoning fame, invented the first commercially available poultry seasoning blend in 1867.